Yesterday Huawei unveiled their new smartphone, the P30, at an event in Paris and announced that consumers who pre-order the.. 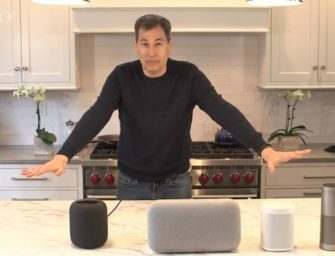 In a Google press conference at CES 2019, it was confirmed that Google Assistant would be integrated into the Alexa-enabled..
Today, there are many smart speakers on the market. One thing they all have in common is the presence of.. Variety is reporting that Sonos is considering an IPO. The conclusion was derived from several new job listings for the..
Voicebot reported yesterday about Consumer Reports testing that revealed Google Home Max and Sonos beat out Apple HomePod for audio.. There are many, many reviews of Apple HomePod which began shipping last week. They almost universally fall into one of.. The Apple HomePod was supposed to usher in the high fidelity smart speaker era. Shipping delays mean it won’t arrive.. The Apple HomePod delay until 2018 was revealed late Friday. That means Apple will miss the entirety of the 2017..